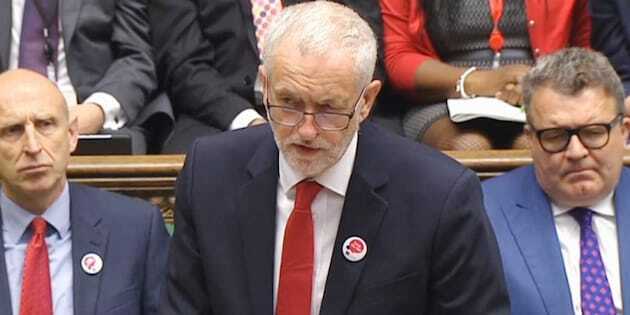 Jeremy Corbyn has sacked three of his top team - and forced another to quit - after they defied his orders not to back a ‘soft Brexit’ in the Commons. The Labour leader and his Chief Whip Nick Brown had warned all of the shadow frontbench that voting for Chuka Umunna’s amendment to the Queen’s Speech would mean them either resigning or being sacked. Shadow Transport Minister Daniel Zeichner quit just before the vote, but Ruth Cadbury, Catherine West and Andy Slaughter were all sacked, HuffPost UK has been told. All of them represent constituencies which had strong ‘Remain’ votes in the 2016 EU referendum. The amendment called for the UK’s continued membership of the single market even after it leaves the European Union. The sackings were jointly ordered by Corbyn and his Chief Whip, sources told HuffPost UK. A reshuffle is set to take place “within days”. The grounds for the dismissals were that all Labour candidates had fought the 2017 election on a manifesto that did not support staying in the EU single market. The Queen’s Speech vote was also of such constitutional importance that indiscipline could not be tolerated, sources added. Corbyn decided to show leniency when his frontbenchers rebelled on the vote on Article 50 earlier this year, allowing some to stay in post. But some in the party believe that in a hung Parliament, party discipline has assumed even more importance. I'm a passionate pro-European & straight-forward politician so I've taken hard decision to resign as shadow minister to back Single Market. Andy Slaughter tells me he "assumes" he's been sacked from Labour's frontbench after voting for @ChukaUmunna's amendment. Some 49 Labour MPs defied their party’s whip - which ordered them to abstain on the vote - and a total of just 101 from all parties backed the amendment. Labour MPs Gareth Thomas and Rupa Huq, who also rebelled against Labour orders, had already resigned their shadow posts in recent weeks. HuffPost UK has also learned that Lyn Brown, the Labour MP who stepped in to replace Diane Abbott as Shadow Home Secretary when she was ill, had already left Labour’s Shadow frontbench team even though she followed the whip. Brown, MP for West Ham, stood in for Abbott in the final days of the general election campaign when her diabetes condition made her unable to carry out her duties. Her departure means that Labour is without a shadow policing minister at a time when it has been exploiting Tory cuts to the police. The Shadow Home affairs team now consists of just Abbott, who also has the shadow immigration brief. Carolyn Harris had already quit and Rupa Huq decided to step down after the last general election. New intake MPs from the 2015 and 2017 elections are expected to be asked to fill posts. Corbyn will now have to carry out yet another reshuffle to fill the vacancies. Deputy leader Tom Watson told Channel 4 News that he was “disappointed” that Umunna had tabled his amendment. “It was unhelpful to move this amendment tonight because we’ve just started negotiations,” he said. The rebellion came after Umunna tried to create a cross-party consensus for a ‘softer’ approach to the UK quitting the EU in 2019. He had decided to table his motion in a bid to give Labour MPs a ‘Labour-led’ vehicle, rather than forcing them to back a Liberal Democrat amendment. The Labour frontbench had not tabled any amendment on Brexit. Speaking after the vote, Umunna ​said: “While it is disappointing that our amendment did not win a majority of votes in the House of Commons, what it shows is that pro-European backbench MPs of all parties are not going to simply submit to a hard Brexit. But Lib Dem leader Tim Farron said: “Millions of people who voted for Jeremy Corbyn were hoping for a new approach to Brexit. They will be feeling utterly betrayed tonight that he has yet again failed to oppose this government’s extreme Brexit agenda. SNP MP Kirsty Blackman said: ”’This debate has shown clearly that this is a parliament of minorities: that the Tories do not have a mandate for their endless austerity or extreme Brexit and the Labour leadership is confused and incoherent over the single market.